We recently finished a series of posts on the 2 good greenhouse gas in which we established that all the “earthlight”, the long wave spectra emitted at the temperature of the planet surface is extinguished within about 100 meters of the surface in the bands comprising the fundamental bending strike zone of CO2. This past series established what CO2 cannot do to warm the planet. We are told that the “wings”, bands outside the fundamental bending zero transmission zone will pick up the slack and warm the planet. This series will explore what CO2 can do to warm the planet. The argument is very simple. The earth emits a finite amount of light. When that light is extinguished by complete absorption and zero transmission, it’s gone! It can’t just sneak around somewhere. The atmosphere completely blankets the earth. In the graphic above transmission to the tropopause at 280 ppm CO2 is shown. There is a large flat spot of zero transmission. 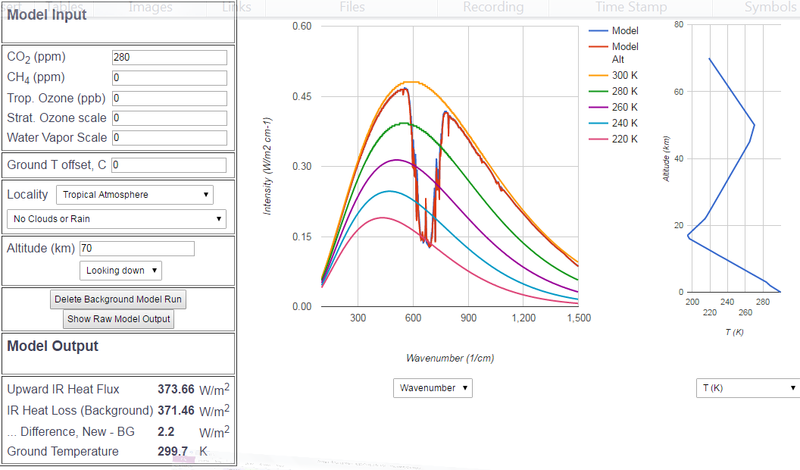 This flat spot is defined by the fundamental bending mode of CO2 shown here at 400 ppm. 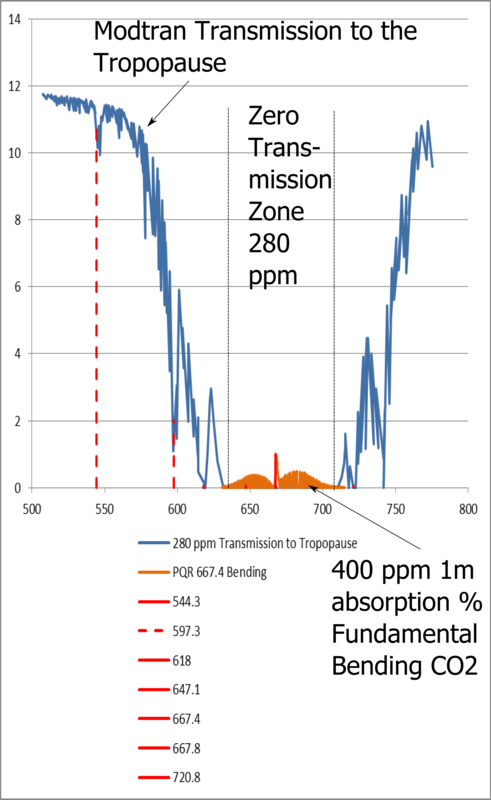 The zero transmission zone grows accordingly when 400 ppm transmission is plotted, but the point here is that zero at 280 ppm and zero now equals zero difference. The red plots are the significant excitation bands for CO2. The fundamental 667.4 band represents nearly 90% of the total energy, and the other bands had to be exaggerated orders of magnitude to even get them to show up in the graphic. Four of these bands fall outside the primary zero transmission flat spot, but two of these, 647.1 and 720.8 form their own zero transmission troughs even at 280 ppm. This leaves only 544.3 and 597.3, shown with dotted lines to their corresponding troughs as candidates for warming in the wings. If your eyes are anything like mine, you will see that there is very little difference between the 280 and 400 ppm plots for CO2 alone and that no large lateral “wings” of radiance emerge. Ain’t much chicken on them wings. In the next post we will explore what makes the “wings” take flight. Water. 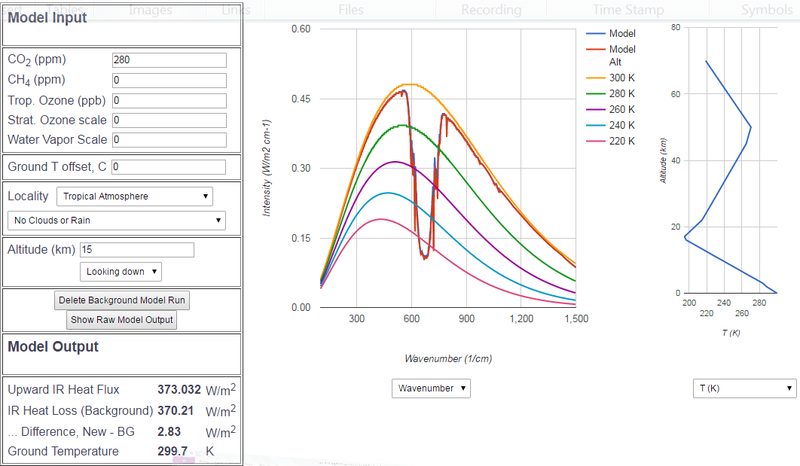 This entry was posted in Climate, Greenhouse Spectra, Radiance and tagged Fundamental bending CO2. Bookmark the permalink.